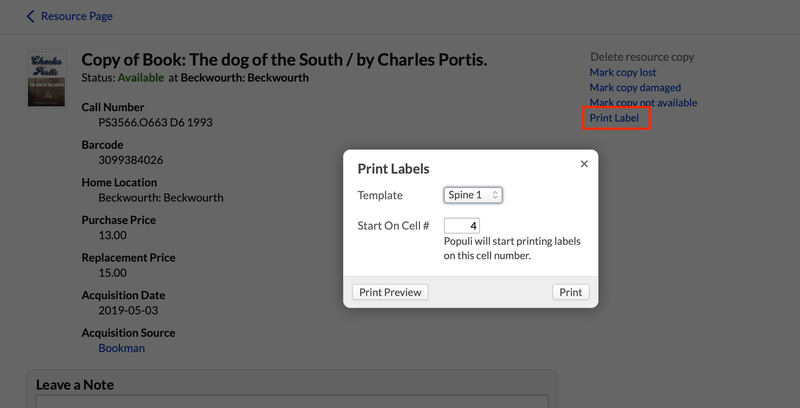 After setting up a spine label in Library > Settings > Label Templates, you can print them either from a resource copy's page, by running a resource batch, or from the Browse Resources tool. Print a label for a single resource copy from the copy's page. Go to the resource page. Find the copy for which you wish to print a label and click View Copy. In the right column of the copy page, click Print Label. Choose which cell # to start printing on (this is handy if you have a label sheet with some peeled off already). Click Print. A new browser tab or pop-up will appear with a printable label. Use your browser's print functions to select the printer and options. You can print labels for multiple resource copies by running a resource batch or using the Browse Resources tool. Go to either Catalog > Resource Batches or Browse Resources. In the right column of the copy page, click Print Labels (in Browse Resources, this is only available for reports that return 500 or fewer resources). I followed these instructions for a group of 3 records. It only printed the label for the first one on the list.